An assembly of random curvilinear shaped pieces of 1 inch thick cedar and pine. 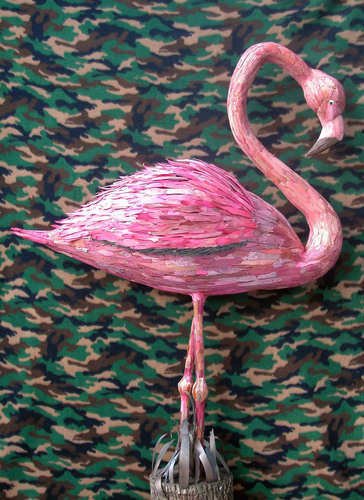 The Pink Flamingo was assembled using hot melt adhesive, solid polyrethane foam and shavings of pine, cedar, bocote, wenge and wormy driftwood. 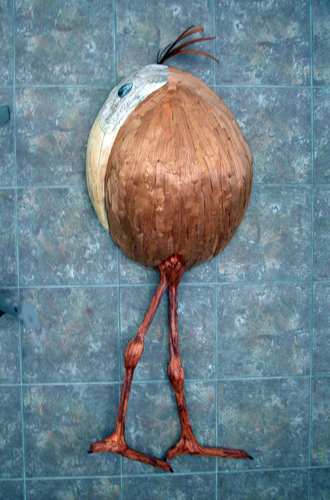 The eye is a seashell and the bird is mounted in a dried hickory stump. 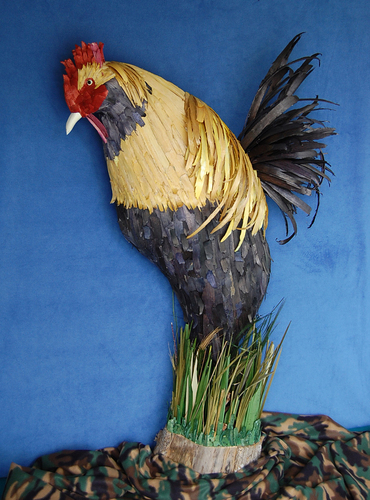 This sculpture was assembled using dyed wood shavings(cedar and driftwood), hot melt adhesive, a shell eye and a cyprus log stand. 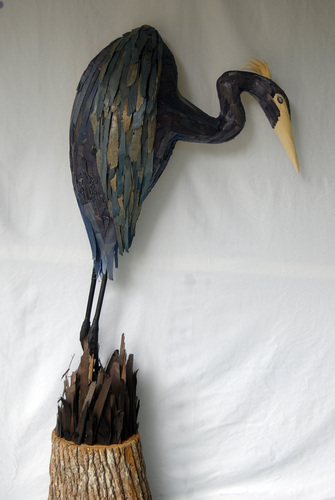 The blue heron was assembled using hot melt adhesive, solid polyurethane foam and shavings fo pine, oak, wenge and wormy driftwood. 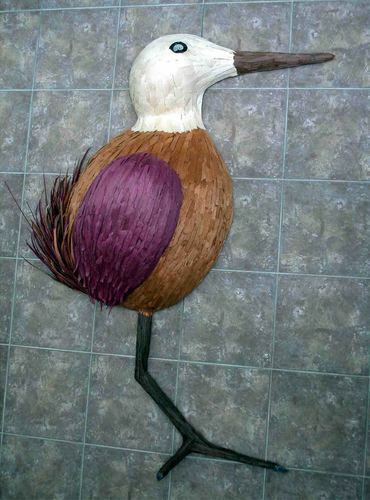 The eye is a sea shell and the bird is mounted in an aged hickory stump. 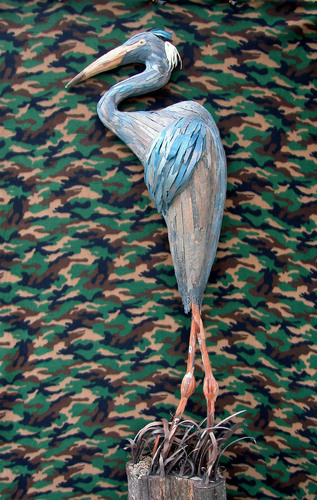 This is a whimsical representation of a green backed heron. It was assembled using hot melt adhesive and shavings of mahogany, padauk and wenge. 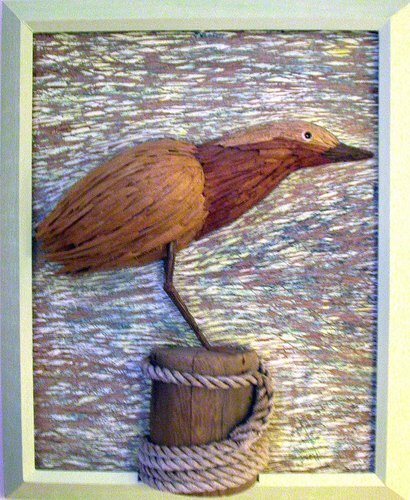 It is perched on a driftwood log and salvaged rope; the assembly is mounted on distressed plywood. This bird was assembled using hot melt adhesive and shavings of pine, cedar and wormy driftwook. The eye is a seashell and the birds sits on an aged cyprus stum. 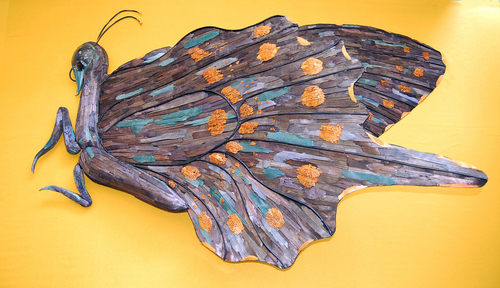 This is the first of a series of four large butterflies-each of which will be 6-7 feet long. 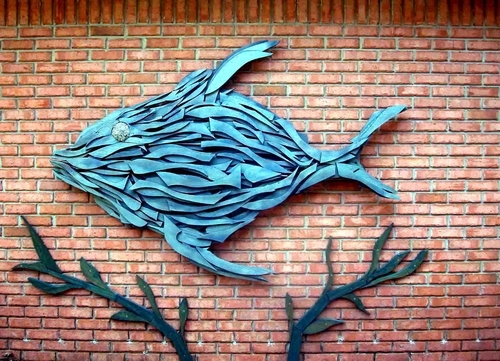 The butterfly was assembled using wood shavings dyed with clothing dye, hot melt adhesive, solid polyurethane foam, and thin plywood. The eye is a large ammonite fossil.